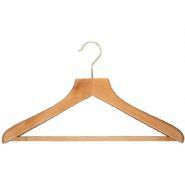 If you are looking to buy coat and clothes hotel hangers in bulk, we have an exceptional range of wholesale hangers for use in your hotel bedrooms. We have the FSC certificate for all our certified hangers to prove that they are made from sustainable certified wood. 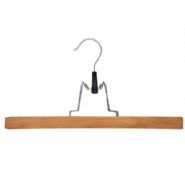 Our FSC range includes natural gloss wood children’s clothes hangers which are supplied in a pack of 50 and includes a non-slip bar which is screwed in and finished with a gold hook and skirt notches. The luxury hotel coat hangers have chunky arms, which make this perfect for hanging jackets and coats. The natural skirt hangers are wishbone hangers made from natural, mahogany and black wood and have gold or chrome fittings, cross bar and clips. We also have a selection of quality satin hangers which are available in different colours including black, green and ivory. 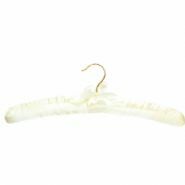 These elegant hotel hangers feature a matching bow and gold hook and are ideal for bridal wear, lingerie and more feminine clothing items. 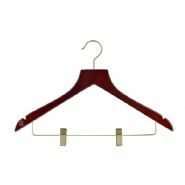 Our trouser hangers are available in natural or mahogany gloss with gold hooks, and contain two wooden bars which sandwich and clip together to hold the trousers. 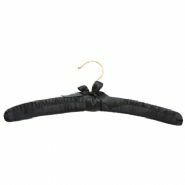 Similarly, our beautifully shaped wishbone hangers are supplied as natural, mahogany gloss or mahogany matt and feature a gold hook, skirt notches and a non-slip bar which is screwed in. 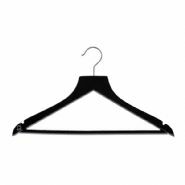 For the cost conscious we also have a range of plastic coat hangers.